Hello, Happy New Year to you all! I hope your New Year is off to a great start! 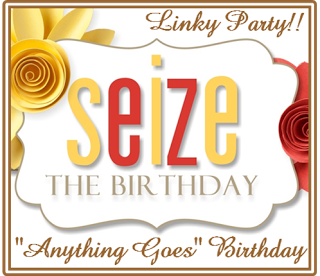 It’s time for our first post of 2018 over at Seize the Birthday and we are starting the year with our Anything Goes Challenge. Just remember it needs to be a Birthday theme. I have had this piece of DP in my scraps for so long, and I was determined to find a place on a card for it, and I finally did. I paired it up with some Verve leaf dies and a sentiment, a SU EF and circle die, and some MFT flowers. Some gold Nuvo drops to top it off. Before I go I would also like to welcome Kristie Goulet as our Surprise Party Guest over at STB. I have been a HUGE fan of Kristie’s for the past 8 years and am thrilled to have her guesting with us these next two months. She is really talented and her blog Kreative Kristie is linked up for you! Please run on over and check it out! We also have a NEW Design Team Member that I am super excited about at STB! Not only is she a hoot she is talented too! Welcome Lindsey M-P from Bashful Blogging. Please won’t you go by and check out her blog as well! Categories: Cards | Tags: Card making, Cards, Happy Birthday, my favorite things, rubber stamps, stamping, Verve Stamps | Permalink. Hope your New Year is starting off great. Beautiful card, Nancy! the colors are gorgeous and I love the design of the three panels! Happy New Year friend!! This is so gorgeous. A fantastic design with the three panels and choice of embossing folders. This is beautiful, Nancy. I love the contrast between the panels. One of my resolutions is to play more at STB. I make a ton of birthday cards but never think to enter them. The colors on this card are fabulous. So glad that you finally got to use the design paper that you had for a long time. Love that. the embossing folder is great for this design too. I love your Nuvo drops, they look great. We really need to talk about them as mine go flat. Aw, thanks, Nancy! I’m very excited about joining this talented team! Your card for this challenge is gorgeous! The die cuts (and embossed panels) are perfect for that beautiful panel of patterned paper. And those little touches of gold make it WOW! You are branching out in new directions. I don’t think I have seen you use this color combo before. I love this card! The design and the colors. Beautifully done! Wonderful card, Nancy! Glad you finally put that pp to use, and in a good place too! Love all those matching sections in the background,and that flower die cut in the front – its beautiful! The patterned paper was perfectly paired with olive green elements! Love the golden accents on your card! Lovely layout with that color scheme — great card! Love this beautiful colour combo and fabulous layout. Happy 2018! Great card, Nancy! 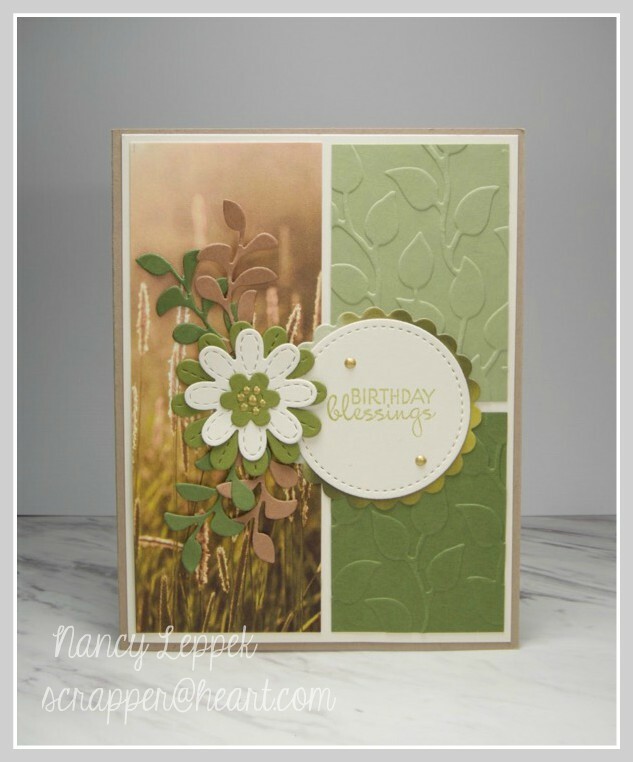 I love the earthy color combo and those gorgeous die cut blooms. All the best to you and your family in 2018!